293T cells were transfected with wild type c-Abl, or the gatekeeper mutation for c-Abl T315I. Transfected cells were untreated or treated with 5mM H2O2 for 10 min with or without pretreatment with 20 nM dasatinib for 30min. Whole cell lysates were resolved using SDS-PAGE and analyzed for PKCδpY64, pY155, and pY311. An asterisk denotes the band representing PKCδpY155. Blots were stripped and probed for total PKCδ, total c-Src, total c-Abl, andactin. Nam S, Kim D, Cheng J Q, et al. Action of the Src family kinase inhibitor, dasatinib (BMS-354825), on human prostate cancer cells. Cancer research, 2005, 65(20): 9185-9189. Morton J P, Karim S A, Graham K, et al. 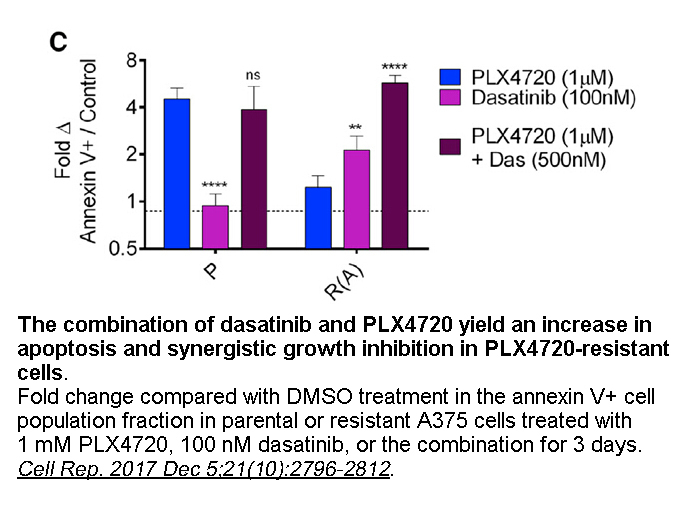 Dasatinib inhibits the development of metastases in a mouse model of pancreatic ductal adenocarcinoma. Gastroenterology, 2010, 139(1): 292-303. 1. Major molecular response during the first year of dasatinib, imatinib or nilotinib treatment for newly diagnosed chronic myeloid leukemia: a network meta-analysis. Cancer Treat Rev. 2014 Mar;40(2):285-92. doi: 10.1016/j.ctrv.2013.09.004. Epub 2013 Sep 17. Randomized trials have been conducted to compare the effects of dasatinib, nilotinib and imatinib in the treatment of newly diagnosed chronic myrloid leukemia in the chronic phase. 2. Docetaxel and dasatinib or placebo in men with metastatic castration-resistant prostate cancer (READY): a randomised, double-blind phase 3 trial. Lancet Oncol. 2013 Dec;14(13):1307-16. doi: 10.1016/S1470-2045(13)70479-0. Epub 2013 Nov 8. Dasatinib is an inhibitor of tyrosine kinase including Src kinases that exhibits antitumor activity, affects osteoclasts and synergize with docetaxel. The efficacy of dasatinib alone or with docetaxel has been assessed in chemotherapy-naive men with metastatic castration-resistant prostate cancer. 3. 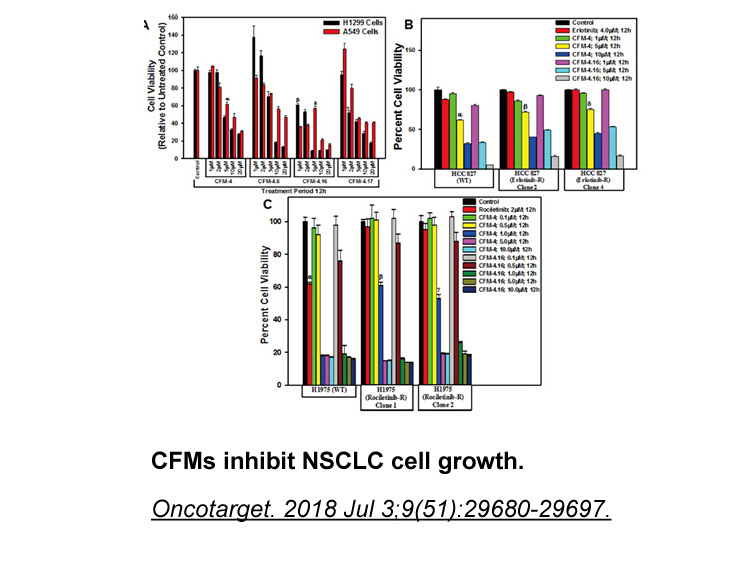 The development of dasatinib as a treatment for chronic myeloid leukemia (CML): from initial studies to application in newly diagnosed patients. J Cancer Res Clin Oncol. 2013 Dec;139(12):1971-84. doi: 10.1007/s00432-013-1488-z. Epub 2013 Aug 13. 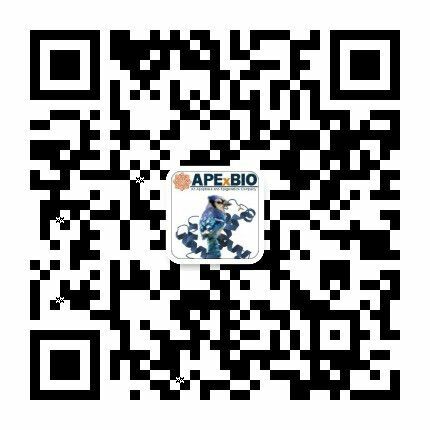 Dasatinib is a dual Abl/Src TKI that inhibits BCR-ABL with relatively greater potency and show potential immunomodulatory effects. 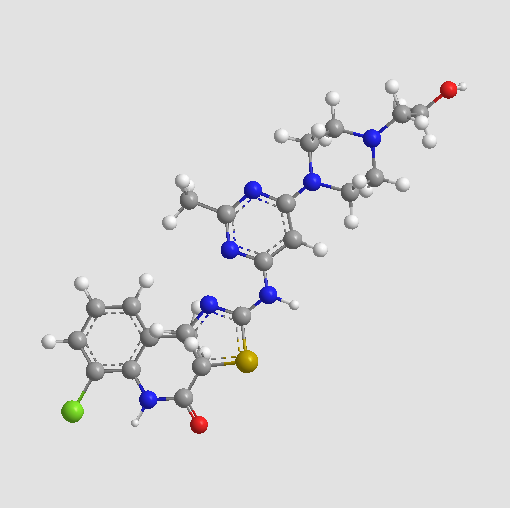 Since it’s been approved to treat CML patients, the development of dasatinib is reviewed. 4. 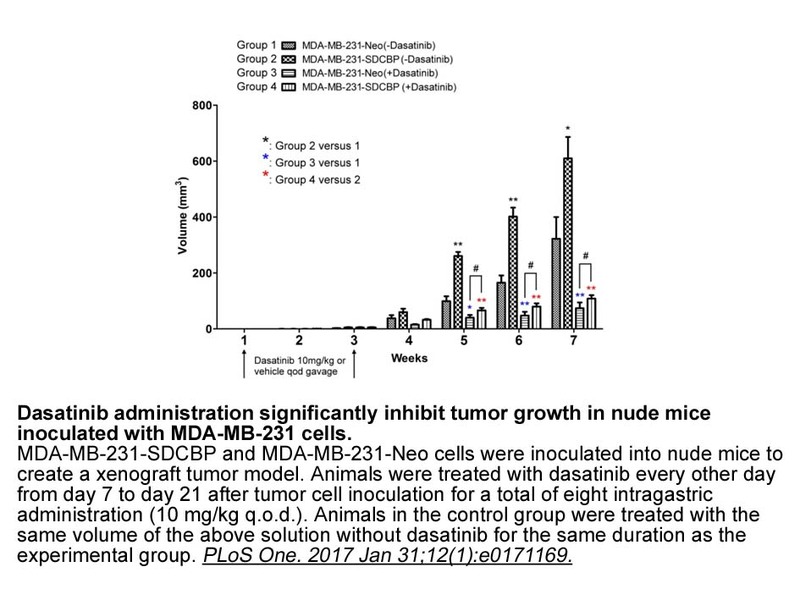 Dasatinib inhibits mammary tumour development in a genetically engineered mouse model. J Pathol. 2013 Aug;230(4):430-40. doi: 10.1002/path.4202. 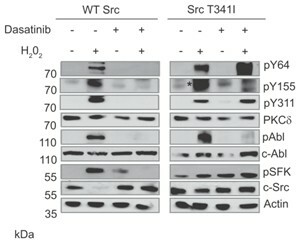 Daily oral administration of dasatinib, an inhibitor of Src family kinases, to mice with breast cancer delays tumor onset and increases overall survival with the occurrence of squamous metaplasis accompanied by down-regulation of ErbB-2 and up-regulation of E-cadherin and β-catenin. Additionally, dasatinib inhibited both migration and invasion of tumour-derived cell lines in vitro. 5. Simultaneous manifestation of pleural effusion and acute renal failure associated with dasatinib: a case report. J Clin Pharm Ther. 2014 Feb;39(1):102-5. doi: 10.1111/jcpt.12107. Epub 2013 Nov 5. 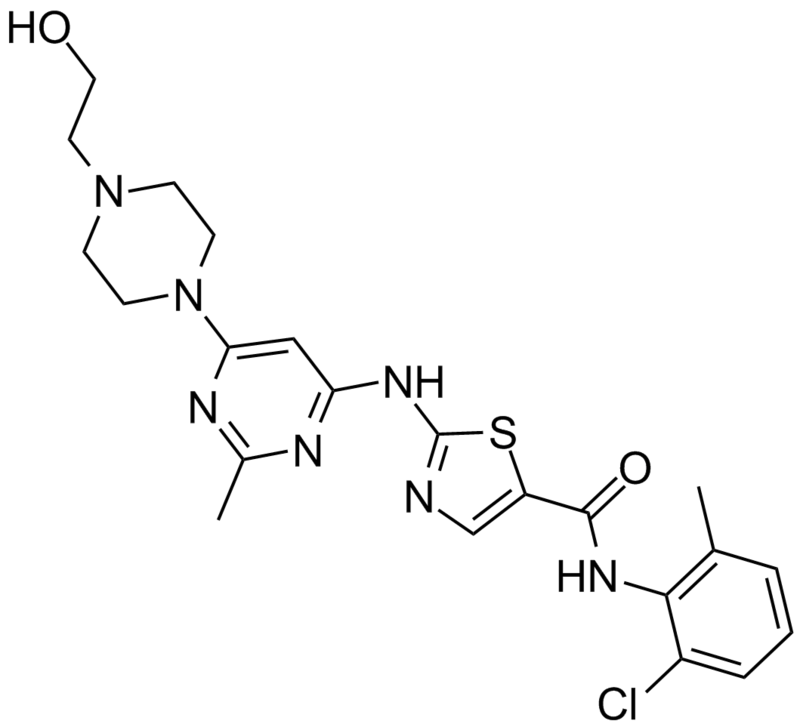 Dasatinib is an inhibitor of multiple tyrosine kinases that are used to treat CML and ALL. Although renal failure is a rare side effect of dasatinib, a patient with imatinib-resistant CML has developed both PE and ARF after receiving dastinib.